The End of Year Award Ceremony is taking place on the last day of term, Friday June 29th at 11:00 am. The principal of Saint Attracta’s Senior National School, Iníon Uí Mháirtín, is delighted to include our awards in the ceremony. 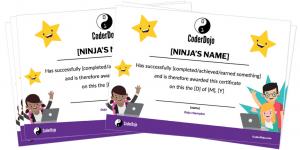 I have applied for official CoderDojo Certificates for the occasion. It is a special day for 3 of our ninjas as they will be moving onto post-primary and leaving our dojo. This entry was posted in news and tagged award, certicate, CoderDojo. Bookmark the permalink. The end of year ceremony looks very interesting Joe Molloy. End of year ceremony??? Iníon Ní Mháirtín never gave us certificates. THERE WAS NO END OF YEAR CEREMONY!!! Everyone who was entitled to badges should have received them online. Check out your profile.